Previous Dr. Burke, Why Does My Child Have Pink Eye? Learn about an eye doctor in Grove, Oklahoma. Dr. Burke: Hi, I’m Dr. Robert Burke, and I’m going to tell you a little bit about myself. Question: Dr. Burke, where are you from? Dr. Burke: I was born in Canada, and during my high school school years, my family moved to the United States, specifically North Carolina. Question: Dr. Burke, what is you your educational background? Dr. Burke: I graduated from North Carolina State University in four years. I received bachelors degrees in microbiology, biochemistry, and chemistry. I then went ahead and furthered my education at Pennsylvania College of Optometry where I received another bachelor’s degree in visual sciences and a doctorate in optometry. Question: Dr. Burke, what is your experience in optometry? Dr. Burke: I have been practicing optometry a little over twenty two years, and I have worked extensively with children, the elderly, and all ages in-between. I have worked in various settings such as HMO environments, commercial, ophthalmology, and private practice. I generally do comprehensive eye exams, and I also do emergency care such as a corneal ulcer, which needs to be treated right away. I do prescribe glasses and contact lenses, and I manage and co-manage many eye diseases such as glaucoma, macular degeneration, cataracts, diabetic eye diseases, dry eyes, and many others. Currently, I practice in beautiful Grove, OK in a private family practice called Burke Eyecare. 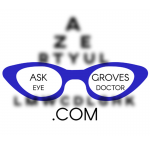 Thank you for your questions at AskGrovesEyeDoctor.com.